As we continue our week of exploring Snowcaster Elves we come to the background for our 58th Random Rolls and first of 2017. Our snow elf comes from a dishonored family, is fascinated with magical items, was mentored by an undead, has a true love, and seeks justice. Linking all that together with her stat array which includes no stats under ten but a midrange dexterity, intelligence, and charisma left me with some tough choices. Firstly I narrowed down my class choices by eliminating divine classes. I did this both because of the average wisdom score and an idea that instantly popped into my head when I saw the background rolls. Although she liked magic items I found her conflict subject being a spellcaster as a reason to rule out an arcane caster as well, even with the decent intelligence. Eventually I narrowed my choices down to investigator or cavalier and I went with Cavalier. I specifically choose the Order of the Seal, although that too took a lot of back and forth with the Orders of the Land and Penitent being in the running as well. Now without further ado I present this week’s character. Among the Snowcasters, both family and honor are among the utmost importance. Although with tribes of the artic elves being small, dishonored family members aren’t outcast, they are just stricken from the families records. Children of the dishonored bear no ill from their parents misdeeds, but they may never pass their parents name down through the ages to their own children. This is the family that Malbranchalianna was born into. The young Snowcasters great grandfather was an architect considered a chosen of Findeladlara. He built some of the very few grand structures to honor the goddess. 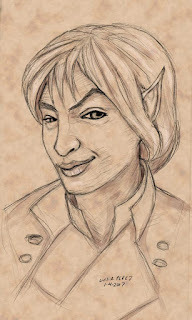 Her grandfather was a cleric and a high priest of Findeladlara. He was one of the council members of the tribe before he let the position fall to a younger elf so he could live out his twilight years. Her father was on track to become the honored staff, the highest rank of warriors tasked with defending the holy places of FIndeladlara. He was however disgraced. Although her grandfather still has a place of honor among the tribe, Her father has been excommunicated by the church. Still in possession of his granted abilities from their patron, he was given the position of twilight speaker. The position is a dubious honor that sets the speaker apart from the tribe by making them the face of the Snowcasters to the outside world. Malbranchalianna grew up hating the church and not understanding why her father still put faith in a goddess who would allow his chosen to fall in such a way. How could the elders not see that if Findeladlara didn't stripped him of his power then his crime obviously couldn't have been so bad. For his part her father never spoke of his wrong doing and like most Snowcasters faced his fate with icy determination. Much of her father’s work was trading with the Ulfen tribes to the west. The family ranged between the mountains of the Crown of the World to the wind blasted plains of the Land of the Linnorm Kings. She grew up in the saddle of one of the great reindeer that many of her people used as mounts and beasts of burden. Being on the back of one of the creatures was as natural to her as walking. Because the dishonor of a family member only effects that person – there are few offense extreme enough to outcast an entire family – Malbranchalianna was afforded every right of a member of the tribe. As she grew older she would spend a season here and there not travelling with her family. Many thought she would take up the mantle of her father or grandfather and become a member of the priests of Findeladlara, but she turned down every opportunity offered to her. The daughter of the dishonored found much of her solace in solitude. She would take her mount out into the tundra and ride for hours on end. It was during these excursions that she found her mentor. In one of the lesser used mountain passes she came upon a man – a human man – who seemed lost and confused. She stopped to help the seemingly freezing man, but it turned out he was beyond help. The human was dead but his soul was still tied to this world because he had died before completing his mission. He was a member of an order tasked with protecting a place called the Temple of the Frozen Heart. Followers of the Empyreal Lords (link tag) Tolc (link god article) and Pulura (link god article), as well as some Snowcaster followers of Findeladlara believed the temple housed a ice like crystal thought to be a piece of the heart of the Demon Lord (link tag) Kostchtchie (link god article). Not trusting Baba Yaga, long ago some of the Demon Lords essence from the Torc of Kostchtchie was syphoned off into the crystal to be hidden away. The man’s task was to return another sacred object a stone that granted its possessor the ability to protect one from any physical harm for short periods of time. He could sense the stone nearby but his body was lost to the ice and snow. His spirit being attached to his body coupled with the fact that in the centuries since his passing the terrain had changed and he didn’t know if the temple still stood meant his mission would forever be a failure. Malbranchalianna's sense of justice – not law which failed her father but true justice – could not let this pass. She swore to help him complete his mission. She would return to him often and allow him to ride her body in search of this Temple of the Frozen Heart. In this time he trained her in the ways of his order and the use of the protective stone. She became a fierce warrior and her childhood on the back of the tribes reindeer served her well. Her time was not always spent with her mentor; she would also use her growing abilities to aid her tribe. Her strength of arms got her noticed by many but there was only one whose sense of right and wrong matched her own. She knew she was in love with him very soon after hearing him speak the first time. But her mission came first, she could not fail the man in the ravine. Despite this her mission couldn’t stop her from seeing justice done among her people. When her young love was brought before the tribe for the crime of theft that she knew he couldn’t have committed, she had to stand up for him. 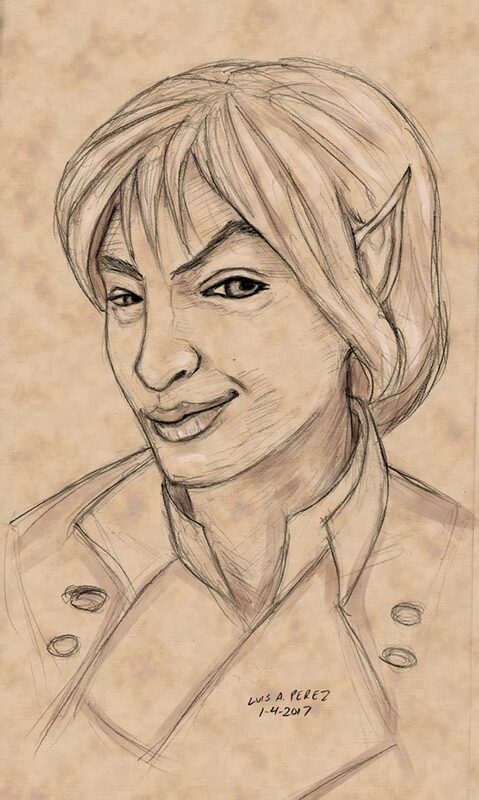 Her undeterred pursuit of the truth discovered that another young elf had framed him because he too was in love with Malbranchalianna. The snowshaper – one of the iceblooded sorcerers the tribe would spawn from time to time – used his magic to make her love appear guilty. With no recourse she pretended to fall for the caster and tricked him into admitting his wrong doing. She used his admission of guilt to save her love, in the process destroying the casters reputation. Even though she proved her love she could not yet take him fully into her heart. It would be a decade more before Malbranchalianna found the Temple of the Frozen Heart. And to its protectors she would return the stone even though it had shown itself to be useful. Although she could not return her mentor’s body she could feel his spirit fade from her body on completion of his mission. She was offered a place among the order which she gladly accepted. Now that she is prepared for her own mission in life, she has embraced her feelings for her true love. She will defend the temple, her love, and her tribe with all her heart. The only thing she yearns for is the return of her father’s honor. But now she may have the means to do that, if she can figure out what his crime truly was. First character of the New Year and she came out quite well. Although I’ve given my reasoning I’m sure there were hundreds of directions this could have taken. What class would you have chosen? Who would her undead mentor have been? Why was her family dishonored in your mind? So many possibilities what were your choices? Like building a character, creating content takes a lot of time and effort. Your support allows me to do things like pay my phone bill so I can spend more time creating and less time worrying. If you’d like to support your favorite content provider – come on that’s me admit it – please consider contributing to my Patreon. If you’re enjoying the blog why not join the rest of the fans of the CRB on our social media hang outs. Facebook, Google+, Tumblr and Twitter all have a CRB presence, and my inbox is open on all forums for question content and discussion. The character illustration was created by Luis Perez. You can find him on Twitter, Tumblr, and on Instagram at luisperezart.